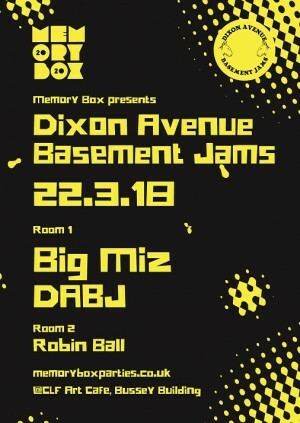 We're proud to kick off our Memory Box 20 20 'into the future' series with a Memory Box x Dixon Avenue Basement Jams (DABJ) show. DABJ is a label well supported on the Memory Box dancefloor so it made sense to invite the guys down from Glasgow for a take-over in the main room at Bussey Building. The DABJ label has established itself as one of the most exciting and influential labels to emerge from the house and techno scene over recent years. DABJ have maintained a quality over quantity approach with each of the releases on the label, working with show stopping underground talent including Denis Sulta, Marquis Hawkes, Vernon, Jared Wilson, TX Connect and Big Miz. Big Miz will be representing the label at this party alongside DABJ the artists - Dan Monox and The Wasp. Meanwhile, upstairs in the warehouse vibes of room 2, Memory Box creator Robin Ball transforms into his Robin Beats persona with the Memory Box Acid Rave 20 20 'into the future'. Carrying on from where the infamous Memory Box Acid Warehouse Rave's left off - playing Acid house, rave breakbeats and techno, Robin takes the acid rave into the future.